Candidates continue to release their first fundraising hauls of the campaign. As the 2020 Democratic presidential primary continues to take shape, top contenders for the party's nomination are releasing their first fundraising hauls of the campaign, a key benchmark of how well-resourced they will be in the early stages of a competitive race. While candidates are not required by the Federal Election Commission (FEC) to report their fundraising numbers for the first quarter of 2019 until April 15, top contenders are often eager to release the initial numbers and the number of individuals that donated their campaigns to demonstrate the viability and grassroots strength of their campaigns. (Justin Sullivan/Getty Images) Democratic presidential hopeful South Bend, Ind. mayor Pete Buttigieg speaks to members of the media before appearing at the Commonwealth Club of California, March 28, 2019 in San Francisco. Earlier this month, Sens. Bernie Sanders of Vermont and Kamala Harris of California and South Bend, Indiana, Mayor Pete Buttigieg released their first quarter fundraising numbers, all reporting substantial totals despite competing in one of the largest primary fields in modern political history. 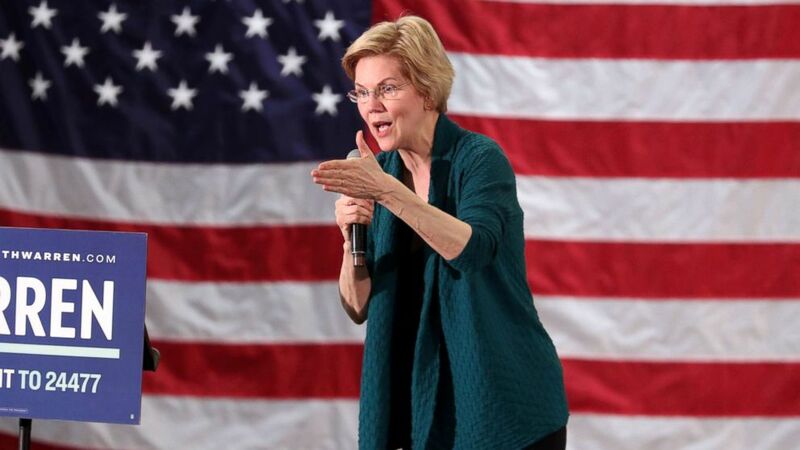 Sen. Elizabeth Warren released fundraising numbers from the first quarter of her campaign on Wednesday, showing the well-known Democratic hopeful in the middle of the pack in a crowded field. The fundraising totals also give an early indication of which candidates will likely qualify for the first major debates of the primary season, which will take place on June 26 and 27 in Miami, Florida. Per standards set by the Democratic National Committee (DNC), a candidate will qualify for a debate if he or she has received donations from at least 65,000 individuals across 20 different states, with a minimum of 200 unique donors per state. Sanders, who came into the race with a pre-existing and active donor base, reported on Tuesday that his campaign raised $18.2 million from 525,000 individual contributors since launching his campaign on February 19. Real change always takes place from the bottom on up, not the top on down. We are building an unprecedented coalition to not only defeat Trump but transform the country into one that works for all people. The average donation to the campaign was $20, the campaign said, adding that 99.6 percent of the money was raised online and that 99.99 percent of donors are eligible to give again. Adding in the money left over from his previous campaigns for the U.S. Senate, the Sanders campaign reported having a total of $28 million of cash on hand, a total they say puts them in prime position to compete across the country. "This campaign will have the resources and the volunteer, grassroots strength to compete in every single state in the primary process," Jeff Weaver, who led Sanders' 2016 campaign and now serves as a senior adviser to his 2020 bid, told reporters on a press call Tuesday. Weaver also made the point that the campaign reached these numbers at a much quicker pace than they did in 2016, when it took them over 100 days to reach the same fundraising total and 146 days to reach the same number of individual donors. Harris' campaign release their first quarter fundraising totals Monday evening, reporting that the campaign raised $12 million from more than 218,000 individual contributions since she officially launched her bid on Jan. 21, Martin Luther King Jr. Day. Ninety-eight percent of Harris's contributions were under $100, and 99.45 percent of her donors can contribute again, the campaign said. "This is a campaign powered by the people, focused on making health care a right, putting $500 a month in the pockets of working Americans, and giving every public school teacher in America a raise. We're excited by the support we're already seeing," Harris campaign manager Juan Rodriguez wrote in a statement Monday night. The California senator came into the race with a proven fundraising track record that she honed in 2018, raising money for Democratic candidates during the midterm elections as she prepared to launch her presidential bid. The former Texas congressman set expectations sky-high when he announced a record-breaking $6.1 million fundraising haul in the first 24 hours of his campaign. (Brendan Smialowski/AFP/Getty Images) Presidential hopeful Beto O'Rourke speaks during the "We the People" gathering, April 1, 2019, in Washington, D.C.
On Wednesday his campaign announced that the candidate raised a total of $9.4 million in the first 18 days of his campaign from a total of 218,000 contributions. Taking the latest numbers into account, after O'Rourke's initial fundraising frenzy in the first 24 hours, he raised $3.2 million over the next 17 days from 90,000 contributions, a notable drop-off. His campaign also did not immediately release the number of individual donors that gave to his campaign in the first 18 days. 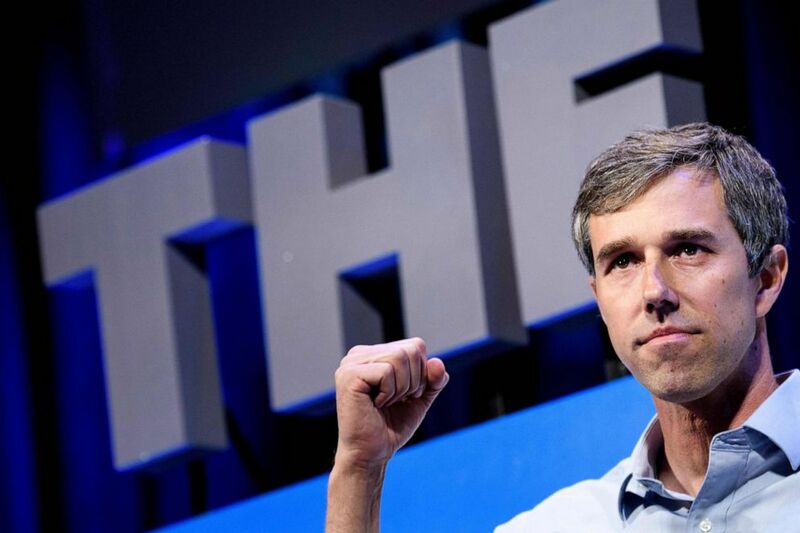 The average donation to the campaign was $43, and the majority of donors over those initial 18 days did not donate to O'Rourke's 2018 U.S. Senate campaign, which earned him national recognition as a possible presidential contender. 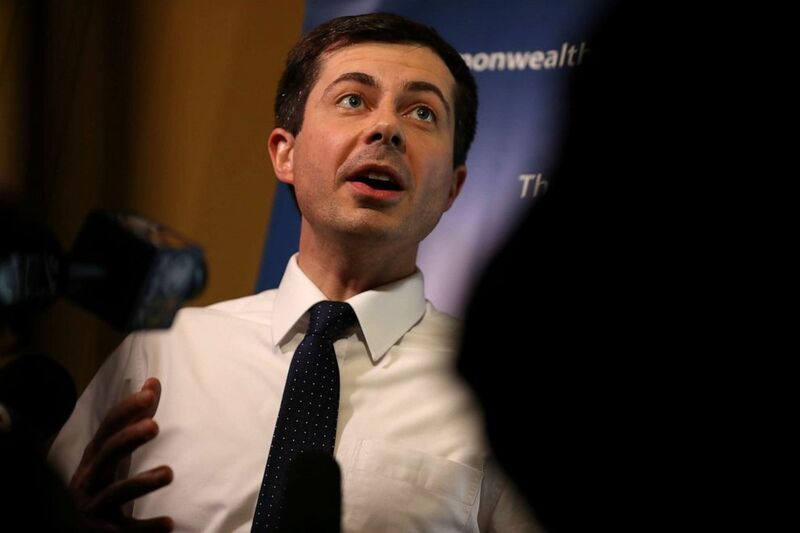 Buttigieg, who launched his presidential exploratory committee on January 23, started off the race virtually unknown to a national audience, but has garnered significant attention in recent weeks as he continues to appear on the campaign trail in states like South Carolina and Iowa. A poll last month from Quinnipiac University showed his support at 4 percent nationally, the same level of support as Massachusetts Sen. Elizabeth Warren, another top contender. On Monday, Buttigieg's campaign announced the candidate raised $7 million in the first quarter of 2019, a substantial total that lends further credibility to the 37-year-old mayor's campaign. In a video released on Tuesday, the candidate offered more details on the numbers, disclosing that his campaign received donations from 155,550 individuals, with the average donation totaling $36.35. The well-known Democratic hopeful finds herself in the middle of the pack in a crowded field. Warren raised $6 million from 135,000 donors since announcing her exploratory committee, the campaign said, and the average donation was $28. (Karen Pulfer Focht/Reuters) Democratic 2020 U.S. presidential candidate and U.S. Senator Elizabeth Warren (D-MA) speaks to supporters in Memphis, March 17, 2019. She also raised only one-third as much as top fundraiser Sanders and half as much as Harris, who had the same number of donors as the senator from Massachusetts. Campaign manager Roger Lau acknowledged in an email to supporters Wednesday that they were "outraised" by some other candidates. "You might have seen some of the big numbers in the headlines, from $7 million to $18 million. Here's a tip: Take a look at the number of grassroots donors — and donations — that candidates report," Lau wrote, pointing to the power of individual donors. "Because [Warren's] been able to count on grassroots donations, she's been able to spend her time visiting as many states as possible, meeting voters, and calling grassroots donors to personally thank them for giving," Lau wrote. Warren's announcement comes on the heels of multiple policies that potentially will alienate top donors within the party, including a tax on the ultra-rich, policies to break up big tech and agricultural companies and a promise to spend time on the trail instead of meeting with top donors. Warren reported $11 million cash-on-hand going forward. 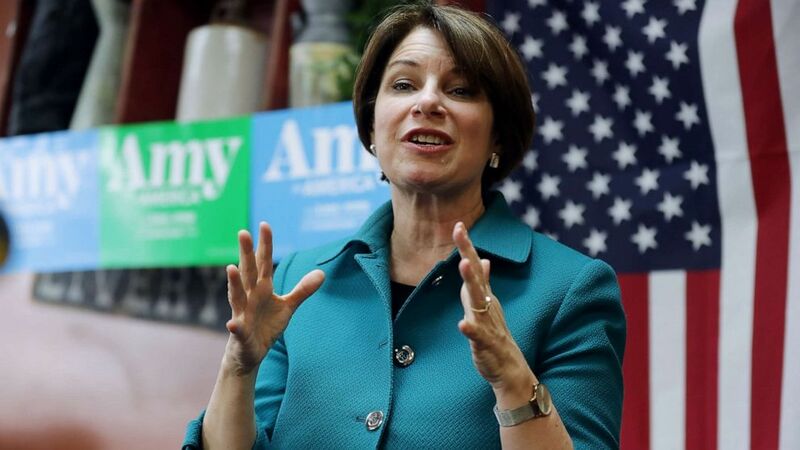 On Monday, Amy for America, Klobuchar's campaign committee, announced that she brought in $5.2 million dollars in the seven weeks from the launch of her campaign on Feb. 10 to March 31. Though the total number of donors or donations are not noted, her campaign described her supporters as "grassroots donors." Klobuchar's campaign said that the Minnesota Democrat's average online contribution was $40 and that 85% of donors gave less than $100. (Chip Somodevilla/Getty Images, FILE) Sen. Amy Klobuchar addresses voters while campaigning for the Democratic presidential nomination at the Pizza Ranch restaurant March 16, 2019 in Independence, Iowa. Booker put out his first quarter fundraising numbers in an email to supporters on Sunday. The senator from New Jersey has raised over $5 million in the first quarter and has more than $6.1 million cash on hand, according to the announcement in his campaign email. The campaign noted that while the average online donation was $34, 82% of the people who contributed were first-time donors to Booker. (CJ Gunther/EPA via Shutterstock, FILE) Cory Booker addresses voters at a campaign stop in Lebanon, N.H., March 15, 2019. "When we launched this campaign, we knew we had work to do," Booker said in his email. "That's why your help these past two months has been so crucial, and it's why I'm so grateful to you. You're the reason we're in this fight, and your support has allowed us to show the country that we'll be in this for the long haul." 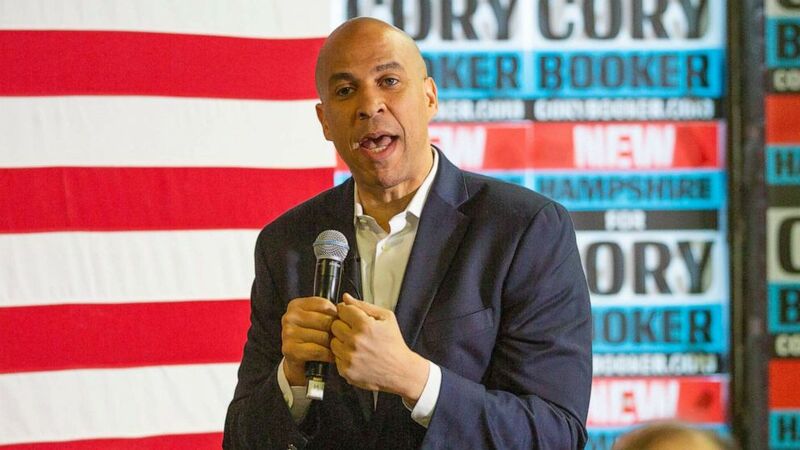 Booker also has $4.1 million in his U.S. Senate campaign account that could be transferred to his presidential campaign, according to filings with the Federal Election Commission (FEC). Yang, another political newcomer, has also been attracting increased attention in recent weeks and has developed a loyal and growing online following. On Tuesday evening his campaign announced that he raised $1.7 million in less than two months across February and March from 80,000 individual donors. As his campaign pointed out these numbers would qualify him for the first two Democratic debates, provided the number of candidates does not expand beyond 20 and he doesn't fall to the bottom of the polls. Who has yet to release their first quarter fundraising numbers? Short answer: the rest of the Democratic field. ABC News' Cheyenne Haslett and Adam Kelsey contributed to this report.